Shalom! 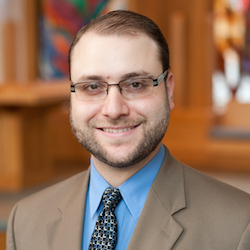 I’m one of the few Spanish-speaking rabbis in the United States, as I spent my childhood in Bogotá, Colombia. Currently, I work and play in Los Angeles, CA, with my wife and 2-year-old daughter. I’m a bit of a part-time rabbi, serving a small synagogue in San Luis Obispo, CA, one weekend per month, and dedicating my full-time work to raising my little one. I’m passionate about finding joy and transformative wisdom in my Jewish practice. Deeply examining the sources, I’m always on the lookout for how a mitzvah relates to modern theories and psychology, and what it can teach me about being a better person. I’m a bit of a movie-fanatic, and often think by referencing scenes and plots. I will at this time not convert men who suffer from hemophilia. I will not work with people who wish to be “messianic Jews” (this is the official policy of all Darshan Yeshiva rabbis). I also will not convert individuals for whom observance will prove impossible (for example, they will have no access to kosher food once converted or will lose their livelihood if they observe Shabbat and holidays) or hopelessly lonely (despite the availability of online communities, being the only Jew in a region is unsustainable).